Both large and small beach balls can add an element of fun to family get-togethers, youth retreats, kids parties and corporate events. Most beach ball games have simple, flexible rules that allow for easy adaptation, depending on the age and size of your group. Whether you want to host a backyard soiree, Saturday picnic, beach bash or pool party, you may find the beach ball just what you need to jump-start the festivities. 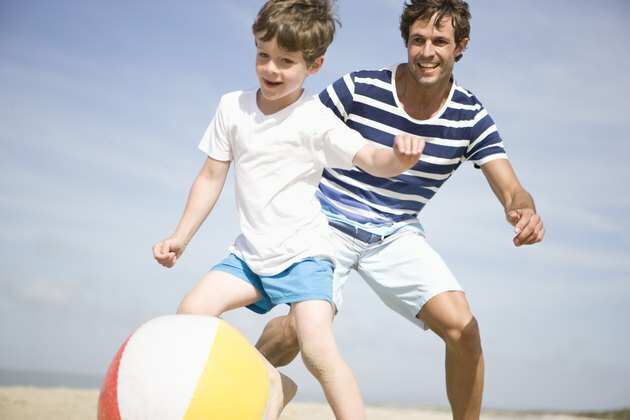 Enjoy a fun, active relay game with Beach Ball Relay. You'll have had to create a relay course with start and finish lines indicated by tape or chalk. Players should remove their shoes and then stand at the starting line in teams of three. Have one member of each team don a pair of sunglasses and hold a beach ball between the knees. Once the starting signal sounds, these team members should move to the finish line and back without dropping the beach ball. The players then pass both items to the next team member, and the team to finish the relay first wins the game. Play a variation on football from the comfort of folding chairs with the Lazy Foosball game. Arrange up to eighteen folding chairs into two football-style team formations that face one another. Teams can have rows of up to three chairs horizontally and up to six chairs vertically. Once you have your team formations, including goal and goalie chairs for each team, then assign players for each team. Every team member must stay seated throughout the game. Play proceeds with each team seeking to score goals by hitting or kicking the beach ball through the goal chairs of the opposing team. Keep track of goals to determine the winning team. Cool off from the comfort of your own pool while playing Pool Ball, a modified game of basketball. Place a laundry basket or large trash container at a designated finish line on the side of the pool. Then designate a starting line and divide players into two teams. Each team must then move its beach ball from the starting line toward the goal basket or container by continuously passing the ball among team members. As soon as a player moves close enough to the goal basket or container, she should try to make a basket with the beach ball. The team that sinks the quickest shot wins the game.